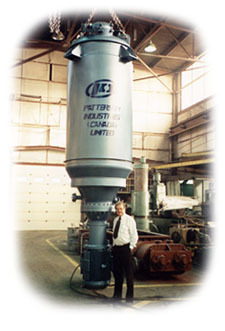 PATTERSON Industries Canada - in touch with the needs of the world's process industries. The growing demand for highly productive and cost effective process equipment has been the driving force in PATTERSON's goal to meet our customers' needs for on time delivery and within budget equipment and services. To meet this objective, PATTERSON Industries has the skilled staff and necessary equipment to get the job done right. Our fabrication expertise ranges from Standard and Low Temperature Carbon Steels, Stainless Steels, Monels, Nickels, Inconels, Hastelloys, Aluminum, Titanium to Clad Materials Bonding. The manufacturing plant can accommodate units up to 16' (4.876m) in diameter, by 80' (24.38m) in length. The PATTERSON name has long been associated with functional design and performance. Every unit or system PATTERSON fabricates is tested to exceed industry standards and to ensure a long, dependable, and trouble-free operation. Our quality assurance program benefits our customers in knowing that we design and manufacture equipment of uncompromising quality and exceptional service. e-mail, fax or phone. We'll analyze your problem and recommend the type of equipment to best suit your process equipment requirements. By clicking and accessing the wide range of PATTERSON Industries Product Data Pages, completing the desired Equipment Specification Page and e-mailing it to our location, we'll be able to analyze your data and recommend the equipment with features to best suit your processing needs and budget.